In order to achieve our goals, working together is imperative. The Hawaiian culture has some really beautiful terms that seem to have been lost in modern times. It’s been A’ole GMO and now A’ole TMT. That is apparently the hot term for fighting everything and waging a war and crusade lately. When I keep hearing a’ole over and over, it really gives me the sense of constant fighting but no semblance of a possible alternatives. If we keep fighting, one side will always be at a losing end. In our own families we don’t teach our children the a’ole way. Parents would go bananas if all they got from their kids was no, no, no and our kids would despise us if all we said was no. Constant battling would become tiresome also. Being in that mindset is just not healthy or sustainable. In my own family, my husband and I create standards for our kids in terms of discipline. Each kid has the same set of rules applied to them at their own developmental level. Our expectations are set the same for both kids as much as is applicable. How our leaders run our state should not be much different either and the standards of the lawmaking should be evidence based. If our laws and activities were not standardly applied to our citizens, there are fights likely to break out. It’s no different when parents aren’t fair with their kids and the kids see and feel it. This just creates dysfunction in the core unit and it impedes the ability to run smoothly. Nothing can get done when there is a constant state of fighting because of the perception of inequality. The concept of laulima is something that have been absent in any of the issues at hand in our state. I don’t even hear our leaders mentioning this term that helped to provide a pillar to build society upon. There are so many problems in the world and so many hands that can be used to build something together. Keeping our hands on signs protesting something doesn’t contribute to problem solving. It only leads to shortsighted decisions that can have too many unintended consequences. The many hands can be put to better use by helping a fellow human in some form or fashion. Those who are willing to work with each other can come to the table and find common ground on the topic and move forward by working collaboratively. This is the example we need from our leadership and participants in any issue. If we continue to forget our roots and not care about the examples we set, our future generations will only perpetuate the negativity. It will live on from issue to issue and the ugliness will continue in our system. I cannot stand by and not speak out about this because this is not the Hawaii I want my kids to know. 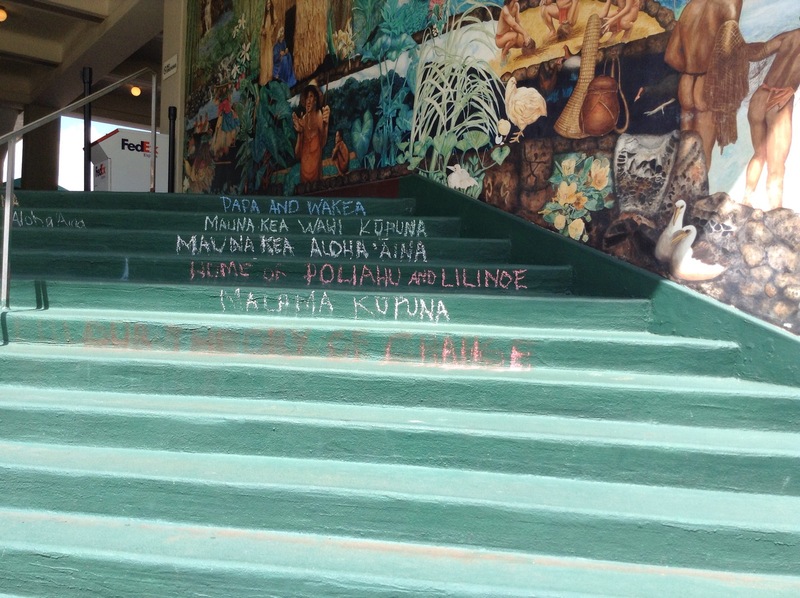 Slogans left on the UH Manoa Campus Center stairs. 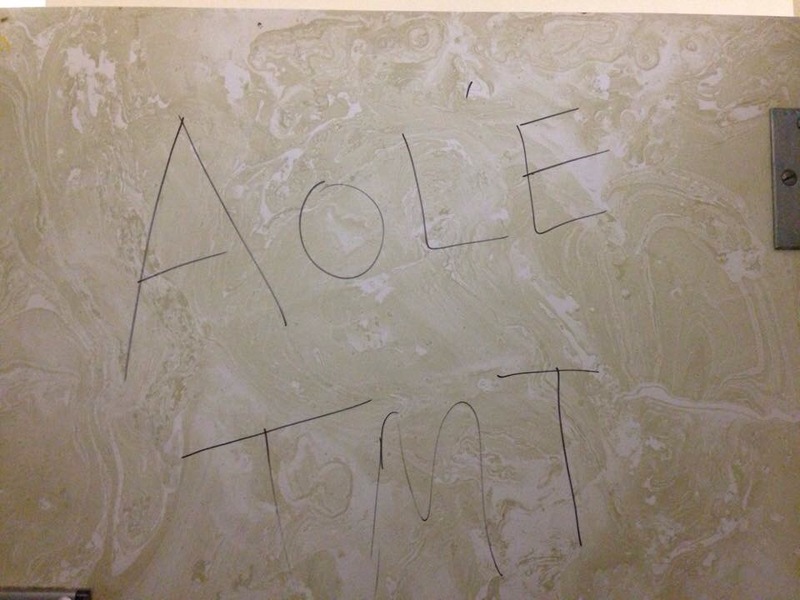 Graffiti left in a bathroom stall on the UH Hilo campus. I’m asking folks to look back at our local roots. Our roots came from using many hands to build our beloved local culture. 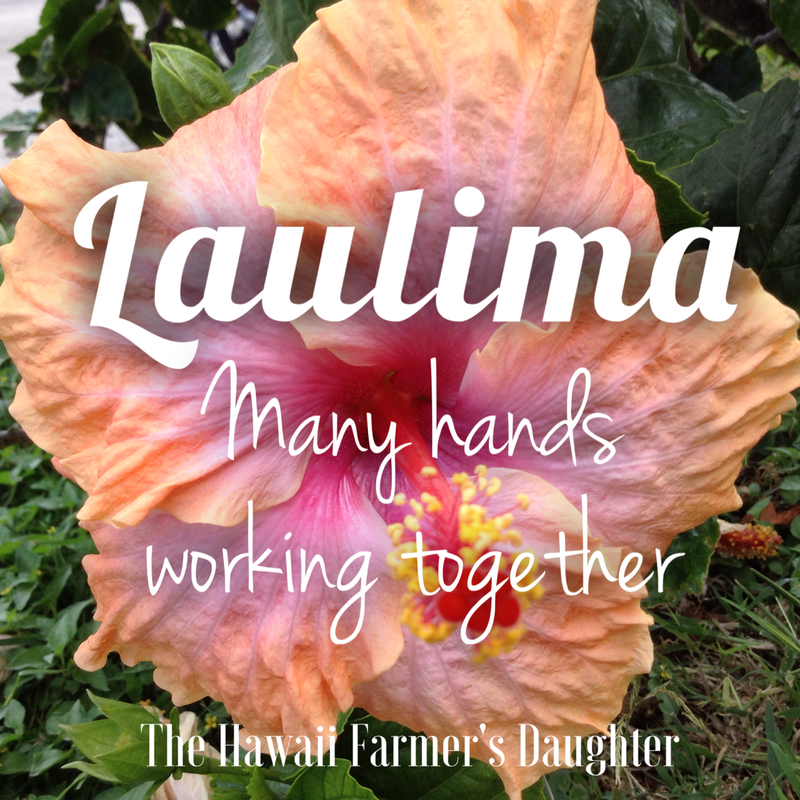 Instead of using a’ole, how about we move forward in saying laulima?